Cheesecake included. 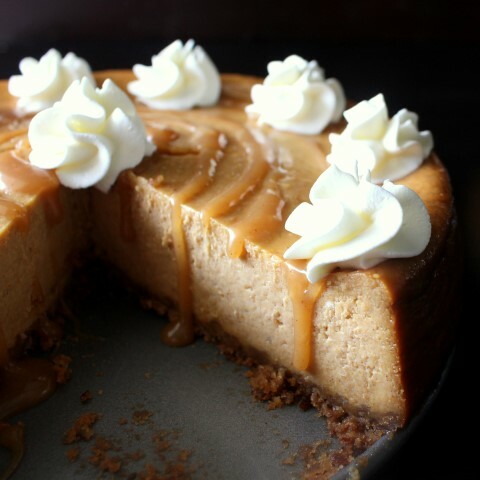 And in my fall mood, I’m presenting you a Salted Caramel Pumpkin Cheesecake. 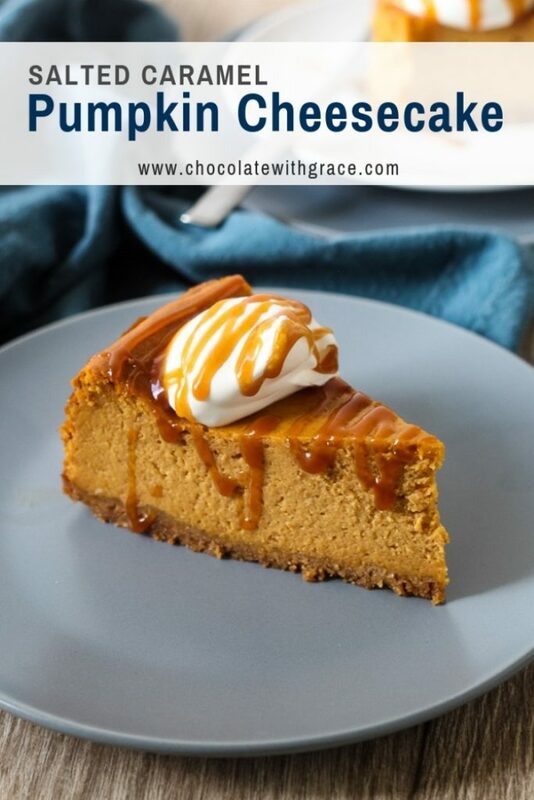 Because I love salted caramel all the time and ’tis the season for pumpkin, I’m in the mood for some diet-defeating cheesecake, and together they make one awesome dessert! Of course, you could tuck this recipe away for thanksgiving, (which would be a very appropriate time to pull it out!) but some cold, rainy days call for a decadent, but delicious cheesecake recipe! Preheat oven to 350 F. Mix the graham cracker crumbs and sugar together. Pour melted butter over the crumbs and stir until moistened. Press the mixture in the bottom of a 9 inch springform pan. Bake for 8-9 minutes. Reduce oven temperature to 325 F. In a large bowl, beat together the cream cheese and brown sugar until smooth. Stir in the pumpkin, flour, cinnamon, nutmeg and ginger. Break the eggs into a small bowl and lightly beat with a fork. Add the eggs to the cream cheese mixture and stir just until well combined. Don't over beat the mixture, or the cheesecake may crack. Pour on top of the graham cracker crust. Bake at 325 F for 1 hour. At the end of the hr, turn off the oven and leave the oven door shut for another hour and a half before opening the oven door. The long cooling period, will help minimize cracks. Remove the cheesecake from the oven and let cool completely. Serve with Salted Caramel Sauce and Whipped Cream. 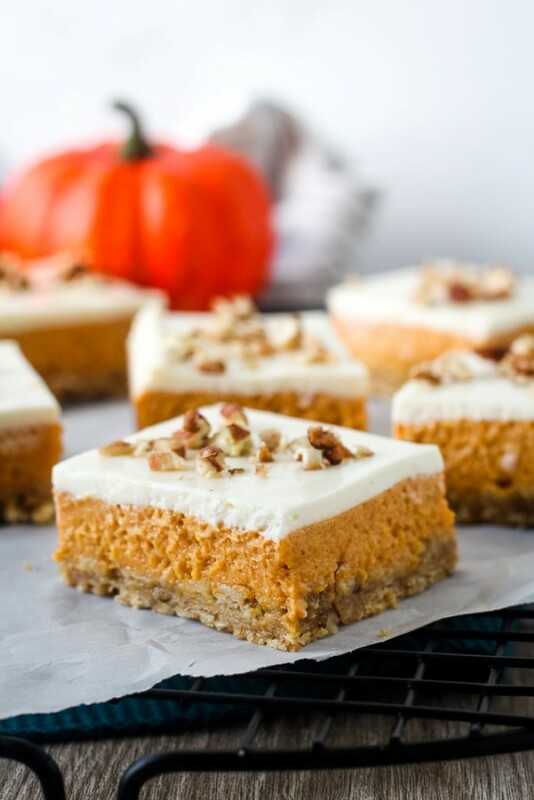 I love pumpkin cheesecake! 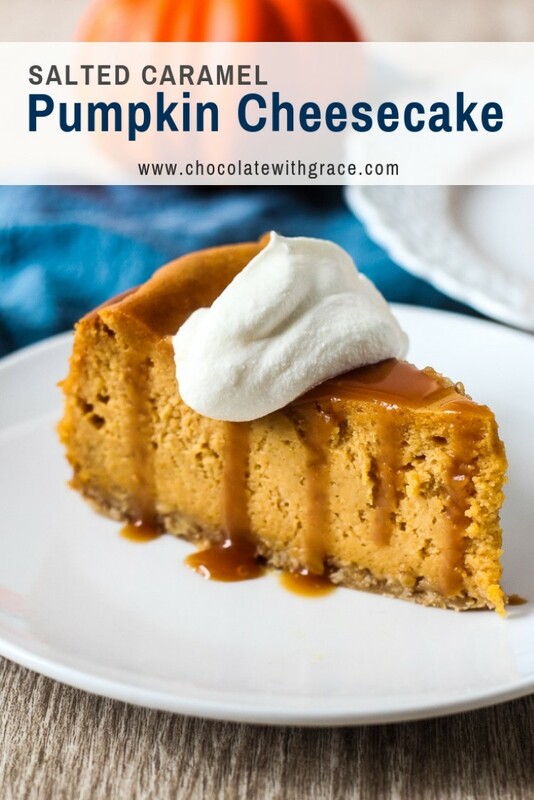 I won’t eat pumpkin pie, but cheesecake….yes please! Looks delicious! I love the salted caramel pumpkin combination! This looks so good! Haha, I can imagine hot chocolate made entirely out of heavy cream would be pretty incredible! This cheesecake also looks incredible! That is too funny, heavy cream and 3 hot chocolate packets?! Wowza! Perfect to go with this cheesecake! Hehe too cute about the hot chocolate, at least he was trying to be sweet 🙂 Oh my, this is one gorgeous looking cheesecake! 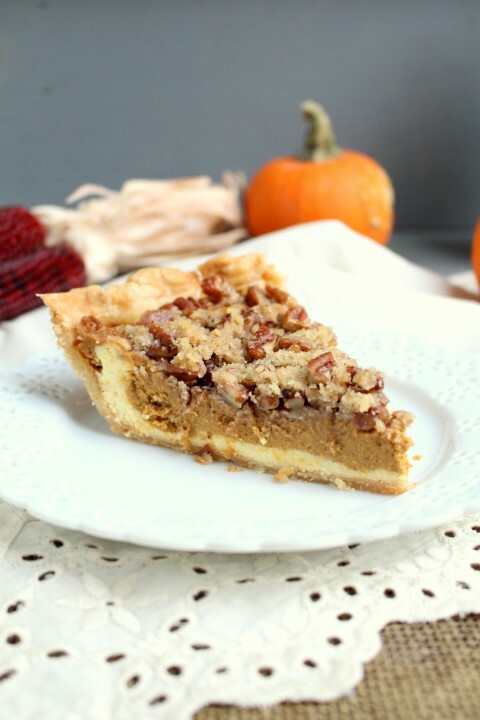 Love the salted caramel and it is definitely worth all the indulging – pinning! Oh boy. I would love a slice of this cheesecake! This is a fabulous cheesecake! I love the salted caramel sauce. It goes perfectly with the pumpkin. Pinned! That hot chocolate sounds like a super way to start the day, this cheesecake looks like the perfect ending to any meal! 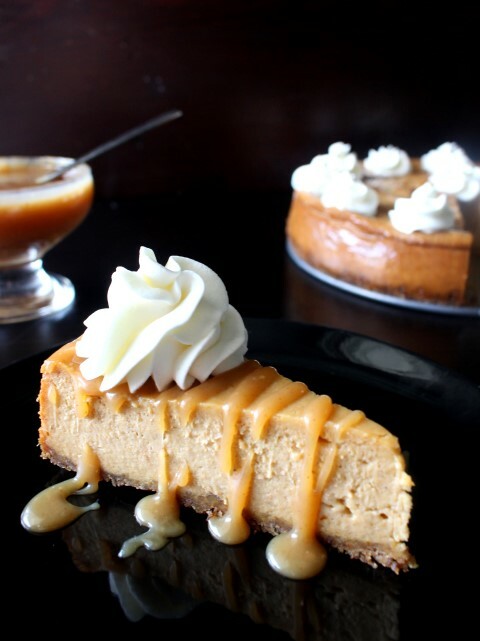 You had me at salted caramel, and then totally sold me on the diet defeating pumpkin cheesecake! Holy yum! This is one heck of a delicious looking cheesecake!!! Thanks, Jocelyn. It’s worth every calorie! Thanks, Jess! Baking with pumpkin is one of my favorites! 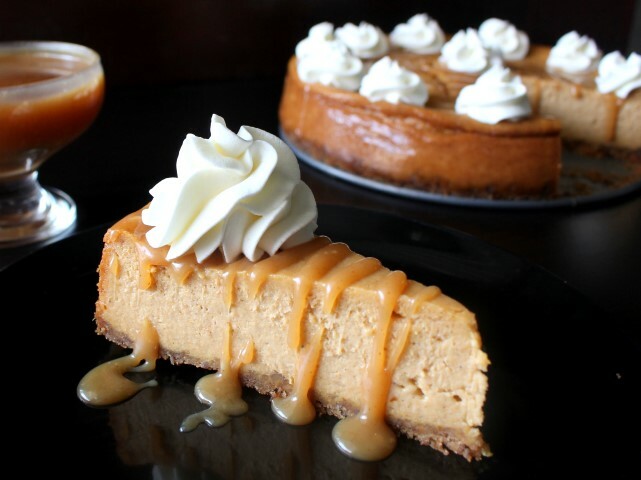 Salted Caramel + Pumpkin + Cheesecake = Be still my heart!! I need to try this—it looks absolutely amazing! It’s absolute comfort food for sure! Thanks for stopping by, Erin! Oh my, this looks and sounds amazing! I don’t know why I haven’t thought about making a pumpkin cheesecake. I better get on that. Love the dark background! OK … Tuesday evenings at 7pm EDT my Wonderful Wednesday Blog Hop goes live. PLEASE come by and share this absolutely gorgeous dessert with us! Pinned it to my Cheesecake, Yum! board. Newest follower / fan here. Mallory!! I love “eat whatever you want” days. . sometimes they are very much needed because if you deny yourself too much, you’ll just go crazy!! 😛 love this cheesecake!!! Absolutely, some days it feels great to throw rules to the wind! 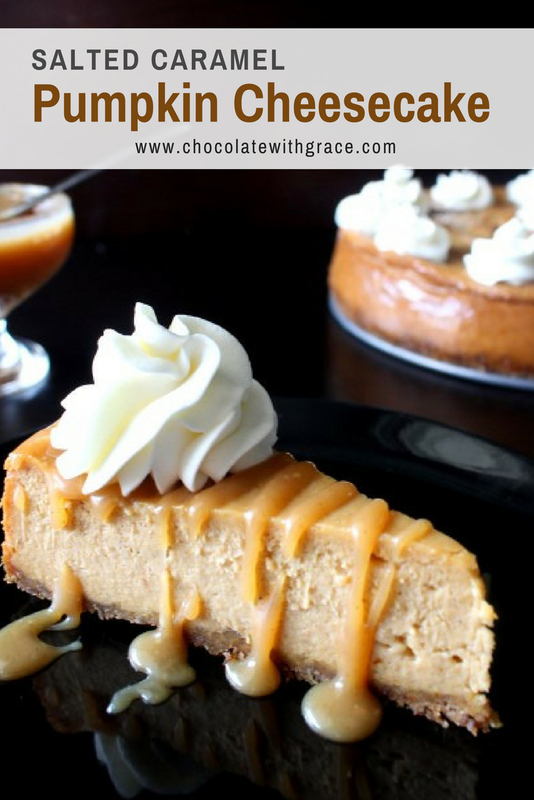 Can’t wait to make this for the 30 family members coming to my home thisThanksgiving – – Do you have a recipe for the Salted Caramel Sauce? Please share! Thanks so much! Hi Stephanie! I love this recipe by Two Peas and Their Pod. http://www.twopeasandtheirpod.com/salted-caramel-sauce/ My advice in using it would be to follow the instructions exactly and use a heavy duty pan. This is a wonderful recipe for Thanksgiving! Enjoy! How long do you think this will last if I permanently this before Thanksgiving? And would it hold up to traveling or turn into a gooey mess? This looks amazing! I can not wait to make it for my friends and family! I do have a quick question before I do, would using canned pumpkin work? Thanks for sharing ! Yes. Absolutely! That is what i used. Happy baking! Can I omit the ginger and nutmeg? Yes. It will change the flavor a bit, but won’t affect the baking. When making, can I use a regular 9×13 pan? Does it have to be a springform? I’ve never done that, but you could try. It would probably be a bit thinner since I think a 9 x 13 is bigger. Thanks for the recipe! I made today. We are having tomorrow. Do I refrigerate it tonight? Thanks! This cheesecake looks delicious. Does the “T” stands for table spoon? I would like to try this recipe for Thanksgiving. That is correct Sheriza. Happy Baking!